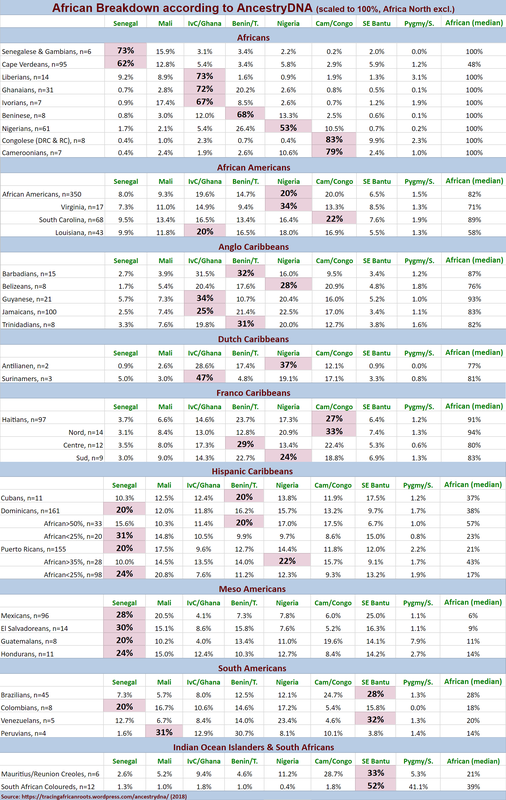 Since the update I have been collecting AncestryDNA results in a spreadsheet in order to conduct a survey of the African origins being reported by AncestryDNA for African Americans as well as other Afro-descended nationalities. Scroll down to the bottom of this page for an overview of the main statistical findings of my survey. At this moment of writing it contains at least 1,377 results for 34 nationalities, among which 515 are for African Americans. For easier comparison I have recalculated everyone’s original African percentages as mentioned in the Ethnicity Estimates so that they add up to 100%. In other words the scores mentioned in my speadsheet represent fractions of a person’s total African ancestry and not fractions of their entire ancestry. Below is a link to the spreadsheet which contains all the results. Besides a tab for the main statistics there are several other tabs on the bottom of the sheet where the individual results can be found, sorted according to nationality. In addition i was also kindly invited by many people on Ancestry.com to view their Ethnicity Estimates. I like to extend my gratitude to anyone who participated in these threads as well as anyone who granted me access to their results on Ancestry.com. Your willingness to contribute to my research has been really valuable to me! I have mainly used acronyms or nicknames in my spreadsheet in order to safeguard everyone’s privacy. If anyone should have second thoughts about being included in the spreadsheet or would like to be renamed, just send me a PM and i will act accordingly. In order to make the results intercomparable, regardless of non-African admixture, i have scaled the African part of the AncestryDNA breakdown to 100%. The scaling formula i used is very simple and can be verified from within the spreadsheet by clicking on any cell featuring a regional score and then viewing the calculation in the function bar (fx) in the upper left corner. All other Excel formulas i used throughout the sheet and especially in the tab “Stats” can also be verified in this same way. Basically i applied the following formula: percentage for a given African region divided by percentage of total African amount, as mentioned in the Ethnicity Estimates. For example, someone with a total African amount of 80% and a “Senegal” score of 20% would be entered into my sheet as 20/80 = 25% “Senegal” out of his total African ancestry. The same regional ratio of 25% could be obtained for a person of only minor African descent who according to AncestryDNA scores 4% “Senegal” out of a total African amount of 16% (4/16). In this manner the regional proportions of the African breakdown become instantly visible for everyone and can also be counterchecked with 100% Africans for example. In order to rule out any entry errors i created an extra column which automatically adds all regional shares up. This column named “Sum” acts as a built-in check as normally it should show 100%. In some cases it still doesn’t precisely add up to 100% however, due to either incomplete or incorrect data. Sometimes it’s also because the original Ethnicity Estimates on AncestryDNA themselves don’t add up to exactly 100% (usually because of the <1% Trace Regions). Regions which were reported with the highest amount by AncestryDNA are bolded in green cells. The frequency of these regions being ranked #1 is also mentioned in the tab “Stats”. The column named “∑ Top 2” features the sum of the two biggest regional scores (already scaled). Combining the shares of the two main regions provides a rough measure of how homogenous or rather heterogeneous a person’s African breakdown might be. In the tab Stats+ i make use of an additional (macro)-regional breakdown into: Upper Guinea, Lower Guinea and Central Africa. This was done in order to comply with what’s common practice in slave trade literature. And also to analyze the regional patterns from a related yet slightly different perspective. It is based on very rough proxies and imprecise delineations. “Central Africa” should be read as also including Bantu speaking ancestry from Southeast Africa. “North Africa” was excluded to enable a more evenhanded comparison with Hispanic Americans and Cape Verdeans. I have also entered additional ancestral details for many individual results. Whenever such information was available and deemed to be relevant. Generally this info is to be found in appropriately named columns either to the far left or far right. 1) Obtaining a better understanding of everyone’s personal results. Generally speaking I find that it’s only by comparing with each other under the same settings that we can derive deeper meaning from our DNA test results. Without any benchmarks so to speak it’s more difficult to get a good grasp of how your personal results might possibly be interpreted and also ultimately how reliable they would be. It is my hope that at the very least the way the African regional amounts have been presented in the spreadsheet has been helpful in adding some more perspective for those who participated. 2) Exploring the regional African origins of people from across the Afro-Diaspora. Attempting to establish how much the AncestryDNA results on a grouplevel can already (despite limitations of sample size) be correlated with whatever is known about the specific regional African roots for each Afro-descended nationality mentioned in my spreadsheet. Future updates by AncestryDNA will undoubtedly produce new and hopefully improved data. The analysis performed by AncestryDNA, even when pioneering and already very valuable in my estimation, is only a first rudimentary step in deciphering one’s origins within Africa. The current nine African regions might very well have different ethnic implications for each separate Afro-descended nationality but also in individual cases. I am naturally inclined to seeing the glass as half full rather than half empty. When reviewing the current AncestryDNA results I have preferred to look for whatever informational value may be obtained already from them. Rather than let any imperfections lead to an overhasty dismissal. To me that would be like throwing out the baby with the bathing water. I have nonetheless maintained a critical stance and attempted to point out any inconsistencies or limitations of the data whenever I could. The sample size for most groups seemed robust enough to warrant some further generalizing analysis. Keep in mind i am just offering my personal interpretations in the blogposts i have written. My research findings are not set in stone but rather based on the (limited) information available to me. Also other people might come up with different conclusions based on the same information. For the purpose of my research i have focused on group averages to get a better grip on the underlying patterns. However it should be stressed that individual variation is a given and it’s not my intention to deny it in any way. Every one in my spreadsheet will have unique family trees including lineages from various parts of Africa. Because of random inheritance some of this regional ancestry might not even get expressed in DNA markers detected by AncestryDNA. Especially for people of minor African descent. Whichever regional ancestry is being reported will often be showing up as either more or less prominent than the group averages. This is only natural. Determining the largest regional components, on average, for each Afro-descended nationality has been a primary research effort. As they can be considered to have the highest reliability at this stage and might also be confirmed independently by historical sources. Some regions, especially when turning up as Trace Regions, will have been termed by me as “minor” or even “insignificant”. But of course this is only strictly relatively speaking. The actual ancestors behind single-digit regional percentages are not of minor importance themselves. They might still evoke some personal interest for anyone who receives the results. I naturally respect this. Still I also think it’s prudent to at least acknowledge the predominant ancestral components you’re made up of. As the people associated with these greater parts of your ancestry will have contributed the most to who you are, at least genetically speaking. During my research up till now I have in no way been affiliated with Ancestry.com. I have been intrigued from the start by the African regional specification provided by AncestryDNA. I personally find it more insightful than anything presently on offer by both commercial DNA testing companies as well as any thirdparty analysis such as available on Ged-Match. Can you help me interpret my DNA findings ? Nigeria 24%- Senegal 16% – Benin/Tongo14%-Mali 13%-African southeastern Bantu10%-Ivory coast/Ghana 2%-Africa South Central 2%-Cameroon/Congo1%- Native American 1% -Asia Central 1%-Ireland 8%- Scandinavia 4% -Europe West 3% – Iberian Peninsula 1% These findings are a mystery to me…having been told much of my life I had much more Native American blood than I’ve seen on this chart & French blood…looking Indian so much so people always ask me where I’m from ?! What am I ? African American ? Hi Toni, thank you for your message and congratulations on your results! To be frank to me your DNA breakdown is perfectly recognizable as being African American as it fits in very nicely within the variation i have observed during my survey of 350 African American results. Unless either one of your parents or one of your grandparents is not African American i would say there is no reason at all to assume you are anything else but African American! Sofar i have not delved too much into the non-African origins of African Americans. However i intend to devote a blogpost to the ethnicity estimates for African Americans as reported by AncestryDNA in its entirety eventually. So keep an eye out on that. I can already say that your assumptions about having considerable Native American ancestry and the actual amount being rather minimal is a very common theme for Americans who get their DNA tested. As i have mentioned throughout my blog AncestryDNA’s socalled “Ethnicty Estimates” can provide very valuable insight indeed but only within a (sketchy) regional framework. You will need additional context/info to pinpoint any specific ethnic details or also combine with other DNA results, especially any African matches you might have. If you are also interested in getting more clarity on your African origins i would advise you to regularly do a search among your DNA matches. You can either carefully browse through each of your pages and look for any matches which seem “African” because of their profile names or the preview of their ethnicity estmates being 100% African. Another way is to search for birth location and type in countries like Nigeria, Ghana, Benin, Cameroon, Liberia, Democratic Republic of Congo, Sierra Leone, Senegal etc. etc. The number of Africans who are taking AncestryDNA tests is small but steadily growing. So the chances of eventually finding an African match will increase with time. Keep in mind though that finding an African match doesn’t per se mean you or your MRCA (most recent common ancestor) share the same ethnic origin as your match. Without any paper trail there will always be several ancestral scenarios which may be valid. Hi! Your blog is fascinating, thank you for sharing. I just received my DNA results, could you help me interpret them? I was born in Zimbabwe to a white ancestral-European mother (so my largest majority is 25% Ireland and 20% Scandinavia) but a mixed tribal Zimbabwean (Shona), English and Cape Malay (or so we thought) father. My results are Africa 18% – SE Bantu 9%, South-central hunter gatherers 5%, trace regions of 4% (2% Senegal, 1% Mali and under 1% Cameroon/Congo and Benin/Togo) and Asia 11% – Asia South 9% and trace regions 2%. Would this be consistent with a native Zimbabwean Shona great grandmother, and a possible South Asian (likely India from the Pashtun and Gujarat regions after reading your blog) migration to South/East Africa from another ancestor? Although looks are by no means indicative of ancestry – I’ve never looked north/west European except for my skin tone, I was surprised at the huge European genetic heritage as I’m always mistaken for Middle Eastern, Eastern European or even Mediterranean. Hello Siani, thank you for your comment. You have a very fascinating background. I would love to view your complete results in order to give you a more detailed assessment. If you are okay with it i would actually really appreciate it if i could also include a screenshot of your results as well as i think they would be very educational for others to see. Is this leading to Haitian background? Is there any specific reason you are suspecting a Haitian background? Instead of looking at regional admixture a better strategy might be to have a closer look into your DNA matches and try to find any Haitian ones and figure out the connection. Keep in mind that you might have DNA matches from many countries though and for genealogical purposes only the close DNA matches (>20cM, 4th cousins or closer) tend to be useful. Were you assigned to the migration called “African Caribbeans”? If so this will make it easier to single out your Haitian DNA matches by using the regional filter on your DNA matches page. Thank you for the response. I ask because it is said from my grandmother that we are Haitian but I’m just trying to find this proof. I see, well in that case your DNA matches should definitely provide more insight. Combined with building up your family tree on your grandmother’s side. Best of luck in figuring out the connection!